A galaxy of India's 123 writers, academics, artistes, legal luminaries, activists and professionals from other fields have taken strong exception to the "intimidation" of some of the best known Carnatic musicians by right-wing elements. Being termed 'traitors of Hinduism', 'shamers of Carnatic music' and 'disgusting cretins', these elements, backed, among others by S Ramanathan, founder of the Rashtriya Sanathana Seva Sangam (RSSS), have been carrying on a "vicious" online campaign against Carnatic musicians in Tamil Nadu through Facebook pages, Youtube and Twitter. Those who signed the letter supporting the Carnatic musicians include Ashok Vajpeyi, Aruna Roy, Justice A P Shah, Shyam Benegal, Girish Karnad, Adoor Gopalakrishnan, Anand Patwardhan, Rajmohan Gandhi, Romila Thapar, Mallika Sarabhai, Shubha Mudgal, Prabhat Patnaik, Anand Teltumbde, Amit Bhaduri, Zoya Hasan, Ashish Nandy, Perumal Murugan, Ramachandra Guha, Shiv Visvanathan, Syeda Hameed, Indira Jaising, Prashant Bhushan and others. Music is an expression of the universal truth of harmony of existence and connects people through its appreciation. It has the capacity to be understood and bring together people across boundaries. It underscores the cross-cutting links amongst religions, lending the plurality into the oneness of sound and its appeal to all human beings and has reinforced beliefs in plurality and tolerance. While the content and the lyrics bring in the varied perceptions and understanding of people and communities, music establishes the universality of a multi-cultural society. Many musicians have received threats by right wing Hindu organisations, for bringing people and religions together on a musical platform. Some of them have been bullied into making apologies and cancelling concerts. OS Arun was invited by T Samuel Joseph a long time student and teacher of Carnatic music to render Carnatic compositions on Christ. He was attacked online and pressure was put on him to cancel. He cancelled citing personal reasons. Within days, WhatsApp and social media clippings of Nithyasree Mahadevan rendering a Christian song began circulating with comments to establish disapproval. The SSVT Temple in Washington DC which had invited TM Krishna to sing, cancelled the invitation at the behest of self-appointed Hindu gatekeepers.T. 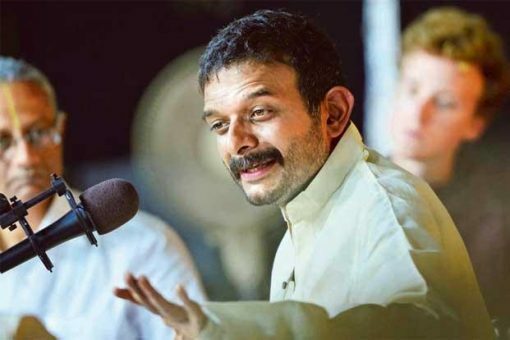 M. Krishna in a statement said: "Considering the vile comments and threats issued by many on social media regarding Carnatic compositions on Jesus, I announce here that I will be releasing one Carnatic song every month on Jesus or Allah".